Let’s Spread Love Pune is a volunteer group where people from different backgrounds take some time out of their regular life. They come together to help the needy people of Pune with a good home cooked meal, once a month and organising fun based learning activities for the kids living in those slums. Our aim is to bring a small change in those needy people’s life who are not lucky as we are. As a part of “Daan Utsav”, LSL Pune will be celebrating the joy of giving week by organising week long activities filled with love, care and kindness for different sections of the society. Below are the different activities which we will be organised. 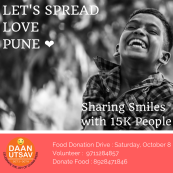 As a part of joy of giving week celebration, we will be sharing love & kindness with 15 thousand needy people of Pune by serving them freshly prepared home cooked food.